Daisies. Directed by Vera Chytilová, Czech Republic, 1968. Carmen Gray is a freelance film critic, journalist, and programmer. Find her on Twitter @carmen_gray. Words are slippery things; their context is everything. Daring Czech New Wave innovator Věra Chytilová’s oft-stated aversion to idenitifying as a feminist has puzzled many over the years, since her films subvert conventional gender roles and chauvinism with uncompromising boldness. But her stance is understandable, if one takes into account the intellectual climate of the Communist-era Prague in which she had to function. Barraged by empty ideological proclamations under totalitarianism, dissident artists had become fed up and suspicious of any rallying slogans. The term “feminism,” regarded skeptically as a western import, was no exception. In that part of Europe, the word had seemed “simply dada,” opposition writer and later president Vaclav Havel once noted. Ever canny, Chytilová eluded any reductive assumptions pinned to labels by her allies as well as adversaries by deeming herself instead an “individualist” and letting her work do its transformational magic on its own. Revolution by stealth, if you will. What does a call to female revolt look like when not announced under a mass-mobilising banner? 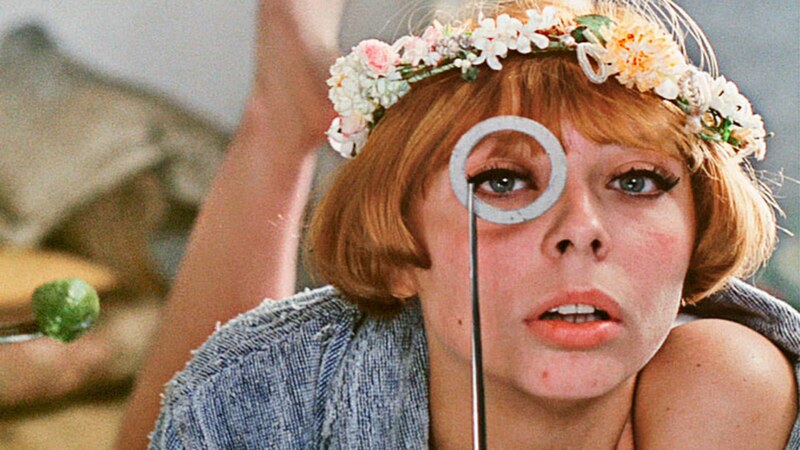 Chytilová directed her greatest masterpiece of rebellion Daisies (1966) during the Prague Spring – a brief window of creative freedom that the Soviets soon cracked down upon. With irreverent energy it tears apart a stifling patriarchal order in a mischievous riot of destruction; its focus upon clearing the ground, rather than organising what may come after. Marie I and Marie II (non-professionals Jitka Cerhová and Ivana Karbanová) are spirited accomplices in mayhem, declaring that since the world has gone bad they’ll be bad too. Older men who aspire to sugar-daddy roles of power are run rings around by the pair who eat their fill then leave them to foot the bill, flipping decorum on its head in an episodic careen around the Czech capital. Their absurdist, language-bending exchanges and unbridled gestures of defiance (at one point, they slice up phallic-shaped foods), play out through psychedelic sequences of boundless experimentation that combine allusions to witch-trial dunking, and archival footage of wartime attack. The Maries’ giggling demeanours are a rejection of a corrupt regime’s posturing gravity. Their extravagant food fight finale – decimating a banquet that’s been set out for party officials, before plummeting from a chandelier – undercuts the Communist trumpeting of worker productivity, and utopian future promised to supposed heroes of developed political consciousness. It was this “decadent” wastage of food that Czech authorities found particularly abhorrent, banning Daisies. But the antics of the Maries create and affirm space for personal freedom – an act that confers dignity on their audience, through methods of outrageous anarchy. Not fearing nihilism or even death, they reject the wasteland around them in the most radical way imaginable. In professing no coherent strategy but uncontainable energy for rule-breaking and pure being, they don’t fight for systemic change. Yet they inspire hope for it, by confirming that anything, even if just for a moment, is possible.